5 stars in Het Parool: "Distressing and moving, deep from the soul"
Release of the album "Sounds of War" with pianist Hanna Shybayeva! The official launch will be at De Doelen, Rotterdam, on February 10th at 20.15. Live stream concert with the Liege Philharmonic Orchestra conducted by Jean-Jacques Kantorow, together with cellist Gary Hoffman, on 7th November at 20.00! New video on Youtube - the Sonate posthume by Maurice Ravel with Hanna Shybayeva during the YPF Festival in Amsterdam: see Audio/Video. The Van Baerle Trio has just been awarded the two highest prizes in the category piano trio at the ARD International Music Competition in Munich: the 2nd Prize and the Public Prize, as well as three special prizes. The prestigious ARD Competition, already in its 62nd edition, has launched the career of artists such as Jessye Norman, Mitsuko Uchida, Yuri Bashmet and Trio Wanderer. The CD of the Van Baerle Trio with works by Saint-Saëns, Loevendie and Ravel has been awarded an Edison in the category "Debut". The Edison Award, the oldest Dutch music prize, rewards every year the best CD in different categories (opera, instrumental, debut...). See www.edisons.nl (in Dutch only). The CD of the Van Baerle Trio is nominated for the Edison Classic Award in the category "Debut CD"! Click here for more information. Just finished recording "La Muse et le Poète" of Camille Saint-Saëns! Many thanks to Noëlle Weidmann, the Liège Royal Philharmonic and Christian Arming, looking forward to the "Caprice d'après l'Etude en forme de Valse" in July! New violin! Maria plays now on a beautiful Carlo Bergonzi (Cremona, 1729) from a private foundation. Presentation concerts of the Dutch National Instruments Foundation (NMF) on 4, 5, 6 & 7 November. Places still availables on 6/11 in Theater Odeon in Zwolle! Maria Milstein is now on Facebook! You can follow her by clicking on the logo below the menu. 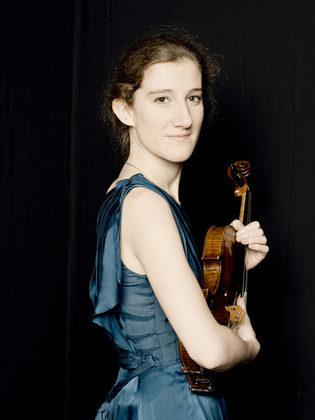 The Van Baerle Trio wins the 7th Lyon International Chamber Music Competition!